Sour, salty, bitter, sweet: According to Wikipedia, the average human tongue has 2,000-8,000 taste buds that detect the five elements of taste perception. And, as Richard and I savored a tantalizing stuffed date appetizer at Grange, each of these receptors were hit like a nail on the head. The spicy chorizo, sweet date and salty-sour blue cheese notes were in perfect harmony; each taste complementing the other in a rhapsody of food, resulting in a flavor that was greater than the sum of its parts. But hold on a minute—what’s that fifth taste perception? Umami (oo-MA-mee), and from what I’ve learned, this is the receptor that may encourage this synergy of flavor. But then again, maybe not; because, according to Wikipedia, umami has no translation. Ever heard the word? 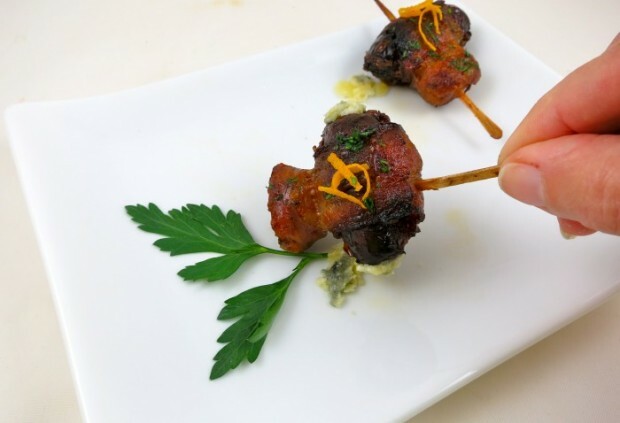 It pops up often in culinary circles, and I wondered if the umami factor also contributes to the palate-pleasing properties of the stuffed dates we enjoyed. I consulted the googlebots to help answer my question. Umami is a Japanese word meaning “pleasant savory taste,” which is rather broad, especially when the other four tastes conjure a specific sensorial perception. For example: lemons are sour; cocoa is bitter; candy is sweet; and soy sauce is salty. So umami is… what? Wikipedia describes umami as the ability to balance taste and round the total flavor of a dish, enhancing the palatability of a wide variety of foods. Merriam-Webster describes umami as a taste sensation that is meaty or savory and is produced by several amino acids and nucleotides (as glutamate and aspartate). From my readings, if you like anchovies, meaty stock, red wine, aged Parmesan, Worcestershire sauce, fish sauce and bonito (fish flakes), you like umami. Fermented soy, asparagus, tomatoes, seaweed and mushrooms are examples of umami-rich vegetables. The more I read, however, the more confused I become. Some writings give umami a bad rap, equating it with MSG, the evil Darth Vader of the seasoning world. Say what? Tomatoes have MSG? There’s alot of conflicting data; the science behind this fifth sense is complex. Whew — tomatoes can come out of hiding. But back to the stuffed dates. Do they have umami? According to an article in Readers Digest, “… umami is why we go bonkers for bacon”. I double-dog made sure my recipe hit all five elements of taste perception—including the elusive umami—recreating the Grange appetizer from memory, then wrapping it in bacon. But, really, should recipe development be fraught with such complexity? So let’s skip the hogwash behind the why the following recipe is delicious, leaving it at this: These stuffed dates have an agreeable taste. Best said, simply put. Soak toothpicks at least 15 minutes in water to prevent from burning. Preheat oven to 375 degrees and line a baking sheet with parchment paper. Slice dates lengthwise through the center leaving one end intact; remove pit. Stuff date with blue cheese and close. 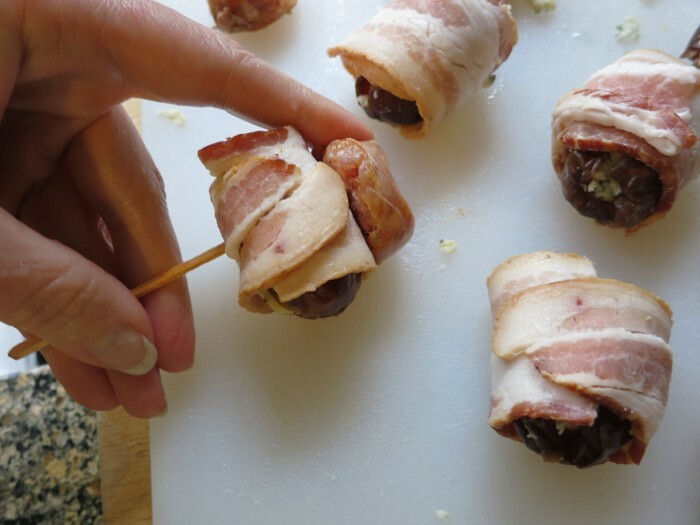 Wrap a piece of bacon around each date. Press a sausage piece against one side of bacon and skewer the date through the sausage and bacon to secure. Repeat with remaining dates. Bake on center rack of oven 7 minutes. Remove from oven and turn dates over. Continue cooking an additional 7 to 9 minutes or until bacon is crispy and sausage is cooked. Serve warm garnished with parsley and orange zest. *You need long toothpicks so the chorizo fits. The smaller picks won’t accommodate the chorizo.